In Clouds of Witness, the second Lord Peter Wimsey mystery novel, a biographical note of the aristocratic sleuth is supplied by Paul Austin Delagardie. Indeed Wimsey became a fantastic cricketer. While at Balliol he scored two successive hundreds for Oxford in 1911, the 112 at Lord’s in particular was of such pedigree and brilliance that it all but blew his cover twenty years later. 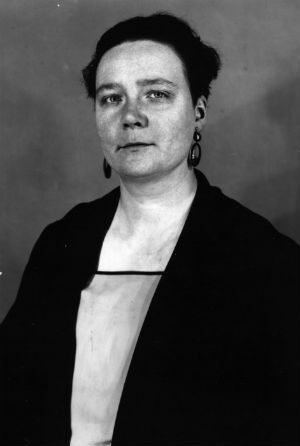 Dorothy L Sayers herself preferred to be remembered for her serious works rather than the enthralling Lord Peter Wimsey mysteries. And her literary gift extended bountifully to the realms of poetry, plays, theological essays and translations. She considered her translation of Dante’s Divine Comedy to be her best work. Alas, the masses expectedly purchased and read the mystery potboilers she penned with far more gusto and her excellent ventures in the depths of literature and philosophy remained the domain of the refined reader. Not that it tampered with her fame. How many books on theology refer to the MCC and the lbw law? One would perhaps have expected CT Studd to pen such lines, not Dorothy L Sayers. Nowhere, however, is the love of cricket more apparent in her works than in the eighth Peter Wimsey novel Murder Must Advertise. It has an entire chapter dedicated to the game titled ‘Unexpected Conclusion of a Cricket Match’. Set towards the climax of this intriguing plot involving the advertising world with ingenious methods of murder and drug peddling, it not only describes a cricket match in exuberant prose; the game also forms an integral part in the puzzle, from nearly blowing Wimsey’s cover to handing him the final clue in the scheme of things. However, even a less than best effort from Sayers has everything in it to be a fascinating read. Perhaps because it was written in tearing hurry, Sayers relied on her own personal experience for the novel’s backdrop. She worked as a copywriter at SH Benson’s advertising agency from 1922 to 1931, by some stretch her longest employment. Murder Must Advertise was published in the autumn of 1932. All her experiences, and the cynicism that a literary mind develops for a soulless profession, were hence crystallised in many of the memorable passages of the book. Herself a successful advertiser, with lasting contributions involving ‘The Mustard Club’ and ‘Guinness Zoo’, Sayers is also said to have coined the slogan “It pays to advertise”. In fact, this phrase appears in Murder Must Advertise and is said by Wimsey as he describes his exploits of diving into a fish pond to his brother-in-law Chief Inspector Parker. There is also the plunge into satire with the description of morality and truth in the world of advertising as the firm Pym’s Publicity is discussed by the same duo. Along with Tono Bungay by HG Wells, this novel may well rank with one of the most accomplished literary works on the world of advertising. Perhaps it is also because Sayers was pressed for time that she fell back on what was definitely one of her other major interests — cricket. The game pops up early enough, when ‘Tomboy Toffee’ engages Pym’s Publicity to develop a series of cricket linked advertisements with slogans that run: “Yah! that’a a Yorker!” to “Lumme, what a Lob!” — featuring eleven famous cricketers. Well, ‘lob’ could have been a bit anachronistic in 1932, when the bowling was fast approaching Bodyline, but then, there is that little thing about poetic license. It is to consult about these advertisements, especially the one reading “Gosh! It’s a Googly” that Miss Meteyard approaches Wimsey who is undercover as copywriter Death Bredon. Wimsey proceeds to explain the intricacies of googly, first with pencil and paper and then in the corridor with a small round tin of Good Judge Tobacco, with which he almost catches the copy-chief responsible, Mr Armstrong, on the side of the head. But serious cricket graces the plot when the firm of soft drink manufacturers, Brotherhood, play Pym’s Publicity in an office cricket match. The selection of the team, dealt with in surprising detail, encroaches on the uncomfortable topic of public school snobbery and class distinction. One of the directors, Mr Hankin, has nothing much to say about the team selection provided he gets to bat at No. 3 and is positioned at mid-on. Wimsey is drafted into the side, turns up in faultless flannels and ancient but authentic Balliol blazer, much in contrast to Mr Miller who affronts the sight in grey trousers, striped shirt and braces. Wimsey promises himself to lay off the fancy cuts to preserve his cover, contemplating an innings of quiet and unobtrusive mediocrity amounting to 20 or so. He, however, is not beyond uttering the taunting chant ‘quack quack’ when a colleague comes back on being dismissed for a blob. Sayers did not only like her cricket, she frequented the society of seasoned spectators often enough to know all about these quirks. She also knew the traits of the unschooled spectator, evident from the way she writes about Mr Pym cheering every slog, and realising too late that the man has holed out. There is the slightly anachronistic reference to the long stop, a fielding position seldom seen any more in 1932. But, then, this was a match between office workers and competent wicketkeepers could have been rare. And finally there is the clue masterfully woven into the action, seamlessly enough so as to be overlooked by all but the most seasoned readers of detective fiction. What touches the heart of the cricket lover beyond all this is the endearing saga of Wimsey the cricketer. Determined to score a mediocre 20 or so, he is spurred into action when a ball from the opposition fast bowler rears up and hits him on the elbow. “Nothing makes a man see red like a sharp rap over the funny-bone … [Wimsey] suddenly and regrettably forgot himself. He forgot his caution and his role, and Mr Miller’s braces, and saw only the green turf and The Oval on a sunny day and the squat majesty of the gas-works.” The imagery is vivid, especially since the match is being played at Romford. Murder Must Advertise may not be the best Lord Peter Wimsey novel. Indeed, the chapters dealing with the Harlequin and de Momerie are somewhat less than the best of Sayers. But as Jacques Barzun and Wendell Hertig Taylor say in A Catalogue of Crime, “The advertising agency is inimitable … the murder is ingenious.” The elaborate scheme involving the drug peddling activities are also devilishly clever, with the advertising firm built into the plot with the hand of a genius. Finally, for cricket lovers, there is hardly a more enthralling description of play to be found in literature. Someone who enjoys his cricket and fancies detective fiction will fall in love with Sayers all over again.